In February 2018, GoSilent, a portable firewall and VPN device that prevents data compromise and communication hacks on connected devices from anywhere in the world, was nominated and named a finalist for the Cybersecurity Excellence Awards in the category of mobile security. The annual awards are produced by Cybersecurity Insiders in partnership with the Information Security Community on LinkedIn, which taps into the vast experience of more than 400,000 cybersecurity professionals. This awards event honors both individuals and companies that demonstrate excellence, innovation and leadership in the field of information security. Finalists and winners are selected based on a combination of the individual nomination and the popular vote by key members of the Information Security community. GoSilent was recently released on the mobile security tech scene in Q4 of 2017, and was highlighted in a segment of BBC Click during the Black Hat USA Conference in Las Vegas, Nevada. The segment, which aired on August 10, highlighted the device’s ability to mask a user’s location and the location of people with whom they are communicating. 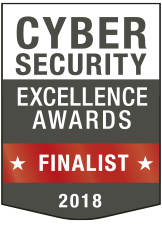 Learn more about GoSilent’s Cybersecurity Excellence nomination or the Cybersecurity Excellence Awards. Silent Circle offers other solutions to help enterprises secure their mobile communications, maintain privacy and protect proprietary data. Learn more about GoSilent here.